With the holiday season upon us, job gains were widespread last month with the professional and business services, retail trade, health care, and manufacturing sectors leading the way. 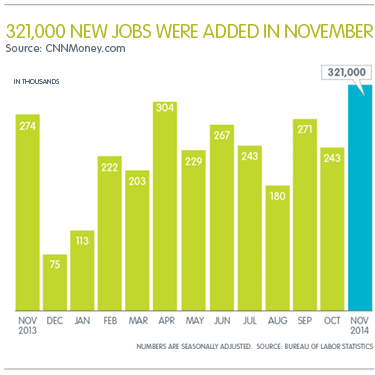 November added 321,000 new jobs to the economy – much better than previous months. While the unemployment rate held steady at 5.8 percent, the number of unemployed (9.1 million) was little changed from October. However, the overall unemployment rate and number of unemployed persons over the year has declined by 1.2 percentage points and 1.7 million, respectively. November’s report showed, that without question, the nation’s economic recovery is steadily occurring. Employment in professional and business services is booming with 86,000 jobs added in November, compared to its average gain of 57,000 per month over the past 12 months. Employment in temporary help services continued to trend up as well with 23,000 jobs added last month. The employed are working slightly more hours each week, but they are earning more too. The average workweek is now at 34.6 hours, and average hourly earnings rose by 9 cents to $24.66. Over the past 12 months, average hourly earnings have risen by 2.1 percent. This month’s BLS shows a few revisions that indicate the market is adding more jobs than previously reported. For September, the BLS revised the number of new jobs added from 256,000 to 271,000 and for October, the number changed from 214,000 to 243,000. With these revisions, employment gains in September and October combined were 44,000 more than previously reported. While the total number of persons marginally attached to the labor force remained unchanged at 2.1 million from last year, the number of discouraged workers (those persons not currently looking for work because they believe no jobs are available for them) dropped slightly (698,000) after an uptick in October (770,000). The number of long-term unemployed (those jobless for 27 weeks or more) was also little changed at around 2.8 million individuals in November. These individuals accounted for 30.7 percent of the unemployed population. Over the past 12 months, the number of long-term unemployed has declined by 1.2 million, indicating the job market is continuing to improve.